The Metroshuttle is a free city bus service and is an important feature of Manchester transport network. This service operates on two circular routes and covers main city areas. Service 1 moves in a loop from Manchester Piccadilly Station through China Town, King Street, John Dalton Street, Deansgate, Marks and Spencer and Cross Street and back. Service 2 begins at Victoria Station and covers Deansgate, Peter Street, Town Hall, Princess Street, China Town, Gay Village, Whitworth Street and Oxford Road Station. It also covers Selfridges, Exchange Square, The Triangle, The Printworks and Urbis. Manchester rail network is served by Manchester Victoria and Manchester Piccadilly stations. Metrolink Trams are an important part of Manchester transport network as they link the centre of the city with stations around Piccadilly Gardens and St Peter?s Square. These trams also provide services to Bury, Altrincham and Salford Quays and Eccles. Piccadilly Gardens Area is the main bus terminal in Manchester with buses leaving for many destinations. Late night weekend bus services are being considered as part of Manchester transport services to help Bolton?s clubbers and workers to get home safely. This service of six new ?Nighbus? series is scheduled to start from end October 2004. These services are expected to run hourly between midnight and 3 am on Fridays and Saturdays with a flat fare of ?2. About 2,000 new buses are expected to be introduced as part of a new transport interchange for Shudehill, Manchester. This is part of a larger effort towards the development of Manchester?s integrated transport system. Measures are being taken to encourage some car users to travel by bus. There are day saver tickets that are available for a range of bus, train and Metrolink combinations. 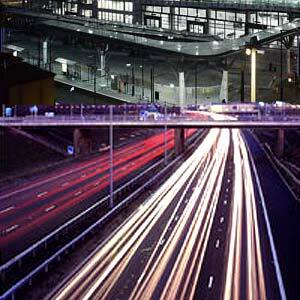 The Station in Manchester is UK?s first multi-modal public transport and airport interchange system. This was opened at Manchester Airport and is an advanced user-friendly passenger system that integrates bus, coach and rail services in one place. The extension of the current Metrolink tram network to include Manchester airport is also being considered. This aims at reducing the car journeys being made to and from the airport. It has been noticed that public transport usage to the airport in Manchester has risen by nearly 10% in the past decade.